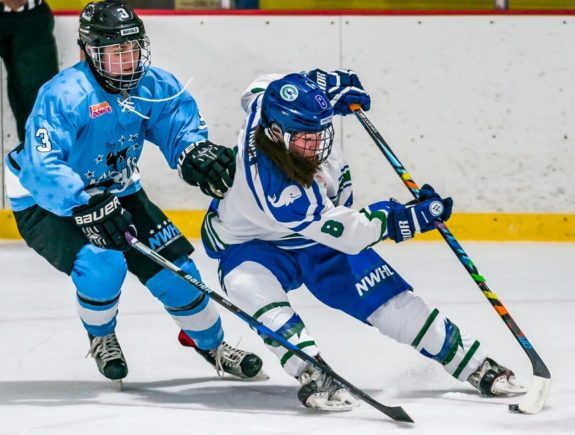 The NWHL season may have just wrapped up, but that doesn’t mean that the league’s players aren’t still helping to “grow the game”. That particular phrase has become a mantra – even a beacon of sorts – as NWHL players generously offer their time and their hearts in order to develop both interest level and skill sets for younger generations. In essence, “grow the game” is a cornerstone to the foundation of the NWHL. The players put themselves out into the hockey community in a wide variety of ways. Furthermore, they are eager to impart their knowledge to a younger generation. This is how the journey of women’s hockey continues to grow and how it is blossoming today. Sarah Edney's ?? performance on Saturday has earned her Co-Player of the Week honors! Congrats, Ed! 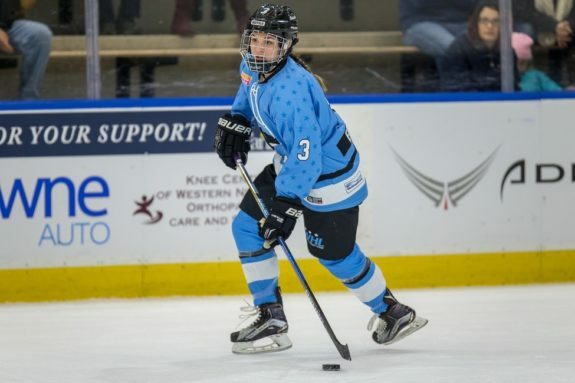 THW had the opportunity to catch up with Buffalo Beauts All-Star defender Sarah Edney. She was kind enough to answer some questions on what young defenders – preteens and teenagers especially – can do to develop further in the defense position. Edney is one of the best defenders in women’s hockey, and the insight that she offered would prove beneficial to both young readers and parents alike. To say that Edney is a powerful skater is an understatement. At times she appears like a thoroughbred out on the ice with her stride and the strength that she is able to generate behind it. Throughout the 2017-18 NWHL season it was a pleasure to watch her skating ability, particularly with how strongly her skates cut through the ice and the push she would use to accelerate. There is no surprise then that Edney is a strong proponent for young defenders to work on their skating, and to utilize it as a vehicle for improving the other aspects of their game as well. Edney practices what she preaches. This was perhaps most apparent in the Beauts semifinal victory over the Boston Pride at the HARBORCENTER on Mar. 17. The 5-foot-6 defender stepped up into the play in the offensive zone, pounced on a Kourtney Kunichika pass and buried it by Boston goalie Brittany Ott. 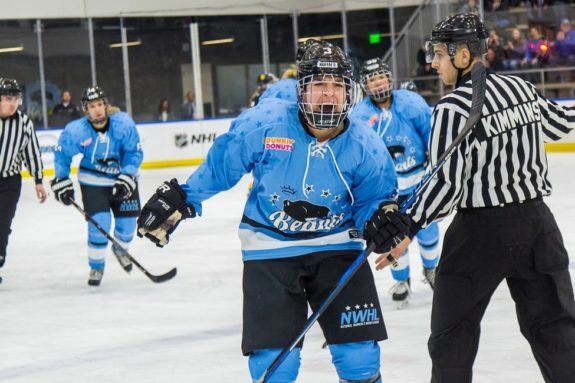 Edney goes down in history as having scored the first home playoff goal in Beauts history. So how did Edney know that it was the right time for her to jump up into the play? This part may be a bit more inherent, but is still something that can be practiced. Edney takes a cerebral approach and reads situations very well. Positioning is a skill that is honed and worked at over time, but it is very important for young players to be aware of their surroundings. Being methodical and seeking out opportunities are things Edney did very throughout her first NWHL season. She was the only player on the Beauts to have more than one point in the playoffs – a goal and an assist in two playoff games. 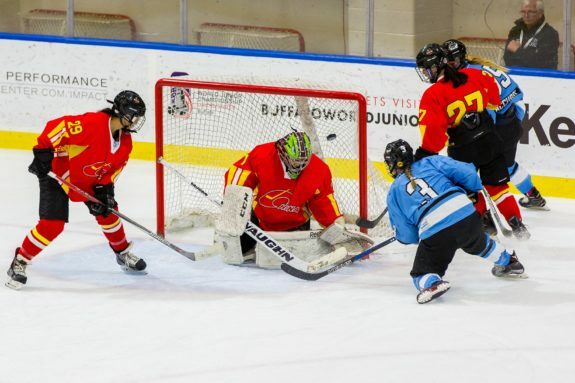 Edney also led all Beauts defenders in goal scoring during the regular season with three tallies too. There is an age old question in hockey. When a defender is caught in a two-on-one situation and backing up to help their goaltender, should they opt to play the pass or the shot, thus allowing the goalie to cover the other option? There are various schools of thought on this and certainly much of it is situational. Nevertheless, it is a situation that defenders of all ages find themselves in from time to time and having to defend against it. Again, deciding on the better option is situational. Edney is certain to point out that if facing the opposite threat a defender would want to handle matters differently. Having good coaching is obviously helpful in deciphering these sorts of situations. Not surprisingly, Edney’s defense coach with the Beauts is three-time Stanley Cup champion Craig Muni who is a former NHL defender of over 800 regular season games. Edney was third among Beauts defenders in blocked shots during the regular season with 10, and she was one of only five Beauts skaters to have double digits in that category. Blocking shots is a science just as much as it is an art. Obviously, while there may be an expectation that putting one’s body in front of a puck will be painful, the important thing is to not get injured. While some pain and discomfort in hockey is inevitable for all who take the game seriously, there are methods to blocking shots where the defender is figuratively using their head more than their body. Edney applies logic to shot blocking as well. These are some key basics that are fundamentals in getting acquainted with shot blocking, especially for those youngsters who are just trying it out. It is gutsy to put oneself in front of vulcanized rubber, but it doesn’t have to be done haphazardly. If applied and utilized correctly, it is a vital ability in a defender’s repertoire. Like anything, it takes a considerable amount of time to become proficient at it. While there are taller players in the NWHL, Sarah Edney is one of the more solidly built defenders in the game. She is noticeably quite strong and is not a player accustomed to being out-muscled. But in saying that there will always be someone bigger than you and always someone stronger than you. This is where defenders must use both their smarts and be able to physically adapt their bodies to the differences of their opponents. The human body is a remarkable piece of work, and it is incredible to notice how a person’s analysis of their surroundings and situations can cause their body to react accordingly. If you are a young defender reading this, then realize that Sarah Edney was once very much in your shoes. Born in Sept. 1993, she is still a young professional hockey player herself. But, she has been playing this game and defending for quite a long stretch. More importantly, Edney has competed at the highest levels. That includes time spent in both the NWHL and the CWHL, as well as having played NCAA hockey for four successful years at Harvard University. She also represented Canada at the 2011 Women’s U18 World Championships and won a silver medal. So you could say that Edney knows a thing or two about the game and the position. She also recalls what it was like to be a young hockey player who wasn’t even a teenager yet. These days Edney would have some technical advice for her younger self. Hopefully there are some 12-year-old defenders who have just learned a thing or two from Edney that they can apply to their own games. She definitely knows what she is talking about and is eager to share her knowledge.